*Athletes should check the list outside the cafeteria to make sure Mrs. Shannon has their physical information. If your name is not on the list, please see Mrs. Shannon for a physical form. KMS Fall Sports Pictures will be on Thursday, October 6, 2016. More information will come from individual coaches. Click here to order fall sports pictures online. We would like to invite the entire Kennett family to join us at Kennett High School’s first home football game on September 2nd at 7:00pm. 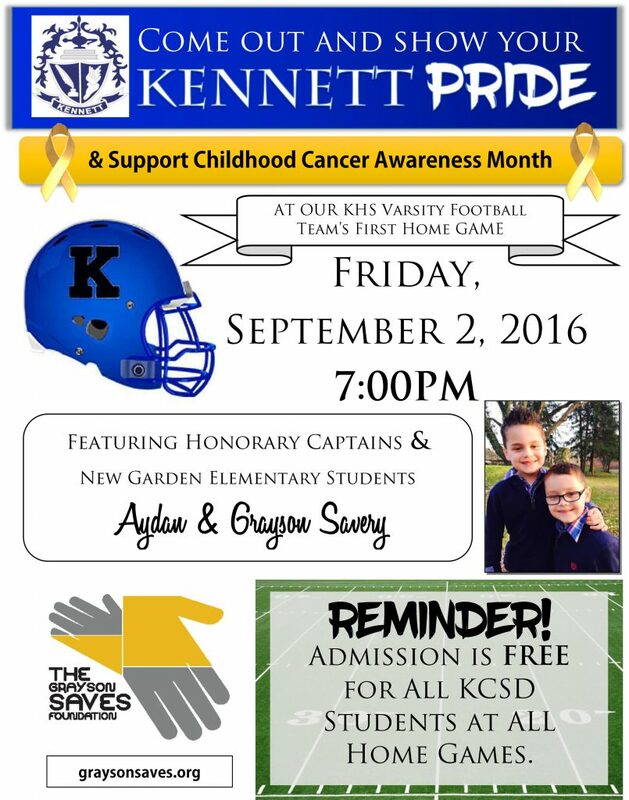 KCSD students, Grayson and Aydan Savery, will be the honorary co-captains. Please come out to support Grayson, Aydan, the Kennett football team and to kick off the start of September which is Child Cancer Awareness Month. Click here to view the flyer that will be sent home with all KCSD students during the first week of school. Click here to view an article about this event in the Daily Local News. Seventh Grade Summer Reading UPDATE! Please note that AR tests will be available the first week of school. You will receive more information from your LA teacher. Kennett Middle School would like to invite all incoming sixth graders and new students to the district in seventh and eighth grades to the our New Student Orientation on Friday, August 19st from 9:30-12:30. 8:30-9:30 Bus pick up two hours later than scheduled times. *Guides can ride the bus too! 9:30-9:45 Students arrive in the FRONT of the school and file into the gym onto the back bleachers. 10:15-10:45 Groups of 15 students at a time will be called to leave the gym and get their schedules and locker combinations then report to the cafeteria. Schedules and lockers will be grouped alphabetically and distributed by the guides at tables in the lobby. In the cafeteria students may sit anywhere and may use the sixth grade wing middle floor restrooms. 10:45-11:45 Homerooms will be called and taken on tours by the guides; Tours should END in the sixth grade wing; Once in the sixth grade wing students should accomplish two tasks before going back into the cafeteria: open their locker and walk through their schedule. KMS students and/or their parents can come pick up their schedules in the main lobby on August 19, 2016 from 1:00pm-3:00pm or 8:00am-3:00pm on Monday, August 22, 2016 or Tuesday, August 23, 2016. Unfortunately students or parents may not pick up schedules for other students who are neighbors, friends, etc. All KMS students will receive a schedule in homeroom on the first day of school, Monday, August 29, 2016. If a student does not know his or her homeroom, principals and teachers will have lists on the first day of school out by the buses. We look forward to another wonderful school year! Enjoy what is left of your summer!